Samsung follows up the flagship lineup of their phones with a beefy rugged phone. This year was going to be no different. 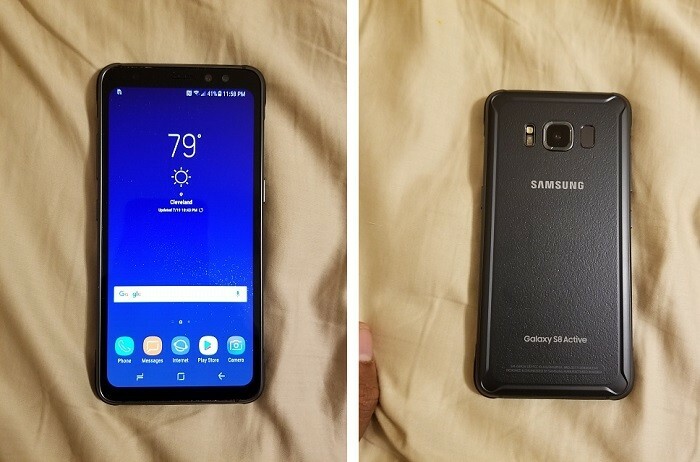 The Galaxy S8 Active looks very close to prime time, as its images and video have been leaked. The video is a 4-minute long clip that will give you a full view of the rugged phone from all angles. While the images were put up by Android Police. Looking at the images, you’ll see all the elegant curves are nowhere to be found on the Active. Well, for that sacrifice, you get a sturdy MIL-STD-810G build that will protect the 5.8-inch flat AMOLED display. The display has thick bezels and an even stronger shell surrounding the chassis on all sides. The display is the same as the one on the Galaxy S8. The phone comes with an IP68 rating so it can take a dunk or two in the water. And it will also survive some falls to tell the tale. The battery is the same as last year’s Active phone. That is 4,000 mAh. That is a significant increase over the 3,500 mAh cell of the Galaxy S8. The rugged handset has already passed the FCC, earlier.